Available at last! The greatest book on AUTOSUGGESTION ever written.!! "Autosuggestion" is perhaps one of the EASIEST methods of controlling your mind, your thoughts, and the things you think about!! This book teaches you Autosuggestion quickly and easily, from the very basic to the most advanced methods. This could very well be the most important book you ever read. If you want to take control of your thoughts, your mind, and your destiny, then you definitely NEED this amazing book. 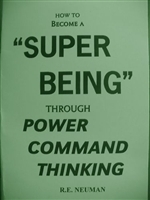 Stop having crummy thoughts all day, and learn to think like a "super being" and have thousands of positive thoughts - per day!! 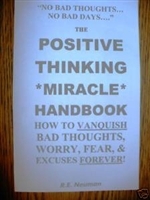 THE POSITIVE THINKING MIRACLE HANDOOK by R.E. Neuman 2010 Solar Vision Publishing, 44 pages! This is the self-help book that gets at the very heart of all problems, all worries, all negative thoughts, and the way in which you create reality itself. Book teaches you how to take full control of your thoughts and your mind, thereby altering your very life experience, and actually taking control of how you experience life. This is easy to read, useable information that is designed to really work right away and be put into use QUICKLY! Aside from taking control of your thoughts and your mind, the book also teaches you to take control of your life by teaching you achieve what you really want to achieve and have the things you want to have instead of creating excuses to use as some sort of pale substitute for these things. 99% OF THINGS THAT PEOPLE WORRY ABOUT NEVER ACTUALLY HAPPEN! THE “WHAT IF’S”: WHAT IF I GET CANCER? EXCUSES: NEGATIVE THOUGHTS IN DISGUISE! ASSIGNMENT #1: LET’S MAKE A MIRACLE HAPPEN - RIGHT NOW! Written by R, E. Neuman, Solar-Vision Copyright 2011, 40 Pages, BRAND NEW, Softcover! Copyright 2009/Solar-Vision Publishing/BRAND NEW/Softcover/32 Pages!! Always wondered where your day goes and yet nothing really seems to get done?? Wish there were more hours in the day? This book discusses attitudes towards sleep and showcases different/alternate sleep patterns you can experiment with to live more all while sleeping less. The famous artist P. Diddy and many sucessful real estate and Wall Street business men live off these alternate sleep patterns and are RICH BEYOND BELIEF!! All of us have our different ideas about sleep and how many hours we feel that we need to get to have a good day, etc. Want to get more achievement out of your life, or you're always looking for something more, or something missing, THIS IS THE BOOK FOR YOU!! 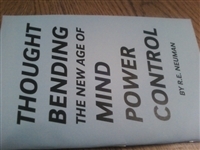 Thought Bending "The new age of mind power control"